Today's Nintendo Direct has officially revealed a new game in the fan-loved Pokémon Trozei series. Pokémon Battle Trozei — the sequel to the original Pokémon Trozei from 2006 — introduces many new gameplay elements as well as a slew of new Pokémon. Pokémon Battle Trozei — which will be known as Pokémon Link: Battle! in Europe — requires players to create groups of 3 or more identical Pokémon to earn points and rack up damage against the Pokémon they are battling. Defeated 'mon can be caught and added to the player’s collection for use in future matches. An additional feature introduced is the inclusion of type advantages. Similar to the main franchise, Pokémon will deal damage based on their type and the type they are facing. This will create many more strategies in order to achieve the best score. Pokémon Battle Trozei allows players to have access to all 718 Pokémon, from Red and Blue all the way up to Pokémon X and Y. As well, the game will feature 4 player cooperative play. This action-puzzle game launches on the 3DS eShop on March 20th in North America and a week earlier on March 13th in Europe. The North American price is $7.99. Will you be picking up this new title? Let us know in the comments. I don't have much hype for this game but we'll see what happens in the future. Even after this people will still say Nitnnedo can't make games for smartphones and tablets b/c it diminishes the brand. This isn't even a 2 screen game, it's a 1 screen tablet game spread out over the 2 screens. Should like nice on the 2DS. Bonus points though for 700 Pokemon, that's a really nice touch. I enjoyed the original, so I'll be considering this one if the reviews are good. Not that bad for $7. I'm a huge Pokemon fan so I might pick it up. I have the original! I used to play this Pokemon puzzle game back on the N64... can't remember the name... Pokemon Puzzle League maybe? Ikd. Anyways, it was one of THE most addictive games I've ever played in my life. I'm DEFINITELY picking this one up. Apparently, this game has a ton of depth to it for a simple puzzle game. I like that. I can't explain my love for the original. This is an instant buy for me once it releases. Ooh, I adored the original. Been itching for a sequel for years, I'll be snapping this up day one. Also how many new Pokemon spin-offs does it take for us to get a new Pokemon Snap? It would be the perfect Wii U eShop game. $8??????????? Sold!!!!!!!!!!!!!!!! Never played the original, but this looks pretty darn fun!!!!!!!! Another win for my ever growing 3DS eShop collection! Nice. I really prefer Pokemon Puzzle League and Pokemon Puzzle League Challenge (my favorite puzzle games) but I would still get this. Plus it's for a nice price so bonus. Does it work with pokemon bank. That's what I want to know. Interested at the $7.99 price tag as it seems to have much more content than it's prequel. That tag-line was there to be hit. Nice. What is different about this from all the rest of the match 3 games that have been reviewed here ? (Puyo Puyo Tetris looks better). Glad to see i wasn't the only one who liked the look of this. My favorite new reveal! I love these type of puzzle games and with Pokemon added to it, it's only going to make it more addictive! Yay! beat that candy crush and dragons&puzzles or whatever its called. And not a 40 euro retail game! yay again! Getting this, as we never got any of the Pokémon Pinball games in the VC. That type advantage gives it a nice extra layer of strategy. What would make this better than say "Jewel Match 3" other than the Pokemon branding which doesn't change the basic game ? Looks interesting, I hope it ends up being fun. @JaxonH That was a reskin of the Panel de Pon series. Another translated version was Tetris Attack for the Gameboy. The Lip's Stick from Smash Bros. is from that series. Probably the fact you're playing puzzles to actually fight 'mon. Pretty intricate, once you think about it. Trying to play the puzzle at the same time you're picking certain 'mon the other one is weak to... yeah, I like it. It's little things like that that can make a regular old puzzle game a real treat. Oh boy, this is exactly the kind of game I'm likely to get addicted to, I'm sold. This looks like great fun. It's been a long time since I played Trozei, and I remember not liking it much, but for $8 this looks promising. Nope, Puzzle & Dragon all the way for me. Maybe I'll get this if I'm feeling generous, but probably not. The premise of this game isn't new, but I don't know if P&D even was the first one to offer puzzle-based combat, either (wasn't there some Street Fighter puzzzle game?). I dare say that the inspiration is obvious, but Pokémon Link Battle offers more simplistic puzzle gameplay and less action, but does so for a kinda more reasonable price tag. Still, Puzzle & Dragon will be my weapon... er, game of choice! I'll look around for the reviews, until them I'm keeping some change on my eShop account. Why Trozei of all games, that's one of the worst Pokemon spinoffs they could've chosen. Mystery Dungeon, Ranger, Snap, hell even Pokepark would've been better choices. @rjejr Nintendo didn't make it, GameFreak made it. Pokemon Company. Nintendo makes Mario and Zelda. Match 3? I could swear the original was the much more original...match 4 (sarcasm as connect 4 would like a word with that...). I hope there will be more people playing this game than there are people playing Dr. Luigi on Wii U. It's so hard to find people, so you mostly stick to one opponent for a while when you do find one. Come on, I just want some multiplayer puzzle game action, eh? I confess that I've never played a Pokémon title outside of the turn-based Strategy title Pokémon Conquest. What intrigues me about this one are its obvious similarities to Might & Magic: Clash of Heroes, which I thoroughly enjoyed. This will very likely be a purchase for me at some point; the 3DS just keeps getting better! @TheBeardMan - "Nintendo didn't make it, GameFreak made it. " Valid point. I have to admit I have a problem separating the 2. It makes sense though that they are separate companies as Gamefreak spent all of last year promoting X + Y which is something Nintendo hardly ever does w/ it's games. SSB is the only 1 that consistently gets coverage. Nintendo does own the Pokemon IP though right? Gamefreak makes the video games and somebody else makes the tv show and the cards? I guess something as popular as Pokemon requires a lot of companies. @rjejr Nintendo owns 55% of Gamefreak. (Which as far as I am concerned makes it part of Nintendo as they have the controlling stake). @unrandomsam - No wonder I'm confused. Does that make Gamefreak 2nd party? Nobody ever talks about 2nd party, it's always 1st - which is self explanatory - and 3rd, also self explanatory. So it's basically a company that Nintendo owns via stock, but it isn't officially a part of Nintendo. So Nintendo could let Gamefreak make an iOS or Android game, make the $ on licensing the IP, and still claim Nintendo itself has never made an "app" game? That's kind of been my argument, I don't think Nitneod has the personnel to make both Wii U and 2/3DS games, so I don't think they themselves should be making the games - though they do if you look at some of the Nintendo Land stuff - but they have enough of a war chest to get GungHo or Rovio to make 1. Almost said Popcap but I guess EA owning them means that's not going to happen. I hated the original Pokemon Trozei so much as a kid. I told my little sister they were making another one and she had the same disgusting reaction that I had. While I'm a pretty avid puzzle gamer, the other Trozei just didn't grab me and I didn't keep it very long. At least they've tried to add something to it, but will it really be enough? Also other Pokemon side games (like Pinball and Rumble Blast) are ridiculously mean about trying to collect the Pokemon- a lot of it is random luck. I hope this doesn't hold up to that tradition as well. 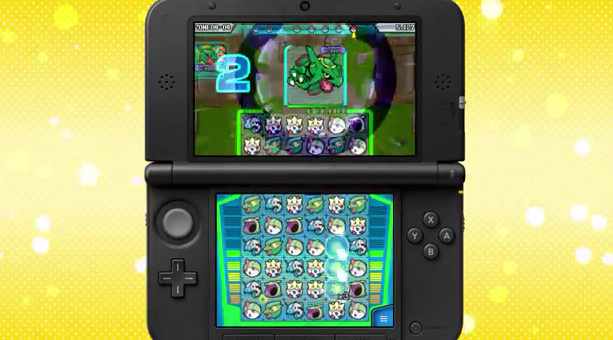 I'll probably give this a shot, but I still really pine for Pokemon Puzzle League ;_; Now there's a favorite. so can the pokemon u catch to use in the future be used in any other games like X/Y? or pokemon bank?